Manchester United vs Newcastle United: Manchester United host Newcastle at Old Trafford desperate for a win to kick-start their season after a four-game winless run. Jose Mourinho’s side struggled in midweek, drawing 0-0 with Valencia in the Champions League. United’s performance was symptomatic of their recent run, as they struggled to break down the Spanish side. It was an improvement on their 3-1 reverse against West Ham last Saturday, although that isn’t really saying much. Eric Bailly was recalled to the side in midweek in place of Victor Lindelof and they did look better for it. Their main problem is in attack. Alexis Sanchez still looks out of sorts after playing from the right-wing on Tuesday. Even Romelu Lukaku, who is usually one of United’s better performers, is struggling up front. Marcus Rashford was their best player in midweek, and after picking up a goal against West Ham, he will be hoping to build some momentum and form. Newcastle are in desperate need of a result. Rafa Benitez’s side were beaten at home last weekend, with Leicester coming away with a 2-0 win. In truth, Newcastle’s squad is one of the worst in the league. They lack a spark in attack and often get overrun in midfield. If it wasn’t for Benitez, they probably would have gone down last year, such is the lack of investment in the squad. They currently sit 18th in the Premier League, with only two points from their opening seven games. That makes them one of only three teams yet to win the top flight this campaign. Anthony Taylor is the referee for this game. The Englishman has officiated seven league games so far this season. He has an average booking points total of 38.6, which is one the highest in the division. As a result, I would advise a maximum of 50 total points for this fixture. Both these sides are desperate for a win. With the pressure building on Mourinho, he must get three points from this game, otherwise, the writing may be on the wall for him. Against any other side, it would be hard to picture a win, but Newcastle are really struggling right now as well. Therefore, I think United will secure a much-needed victory. 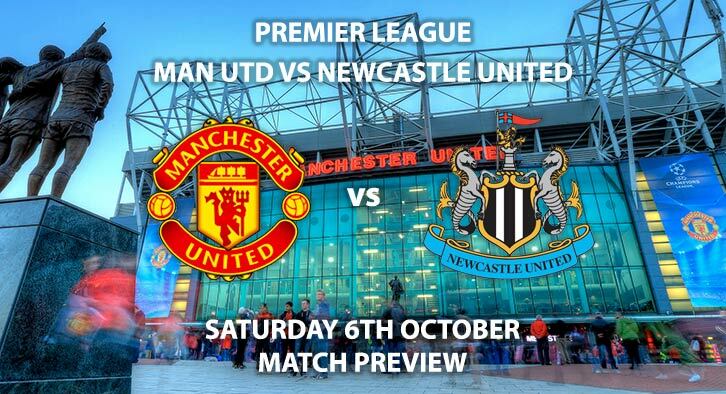 Manchester United vs Newcastle United will be televised live in the UK on BT Sport with kick off at 17:30 GMT. Correct score: Manchester United to win 2-0 – (link no longer available). To win to Nil – Manchester United – (link no longer available). Both Players To Score – Romelu Lukaku and Marcus Rashford – 7/2. Popular RequestABet – 11/1 to 28/1 — Lukaku to score, Manchester Utd to win, Under 12 match corners and 20+ booking points each team – 11/1. (NAP). RequestABet Specials – 80/1 and above – Lukaku & Rashford to score and Valencia & Pogba to be carded – 125/1. RequestABet Specials – 80/1 and above – Lukaku to score a header and Rashford to score from outside the area – 150/1. Popular RequestABet – Lukaku to score a header and Pogba to score from outside the area – 50/1. Odds and markets last updated on Saturday 6th October 2018 @15:50 GMT. Remember to keep visiting the tips and preview area for further updates and betting previews around this tomorrows remainder Premier League action.